As of June 2017, all of the waterfalls here are marked as PRIVATE PROPERTY unfortunately. 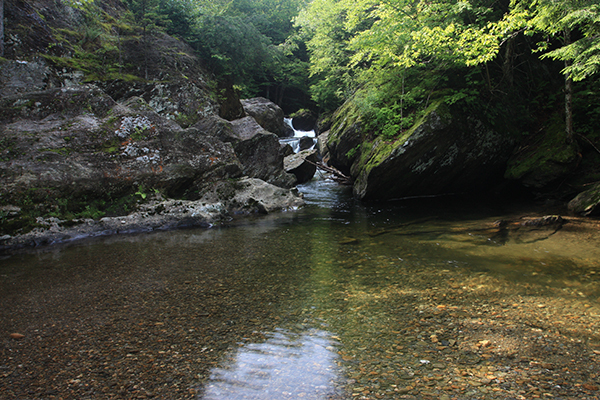 South Branch Falls, often named 'Gibou Road' on other internet websites, is a serious of several drops in the swimming-hole blessed town of Montgomery. There are two falls I'll describe here, but there are likely even more spots along the river located on more private property. 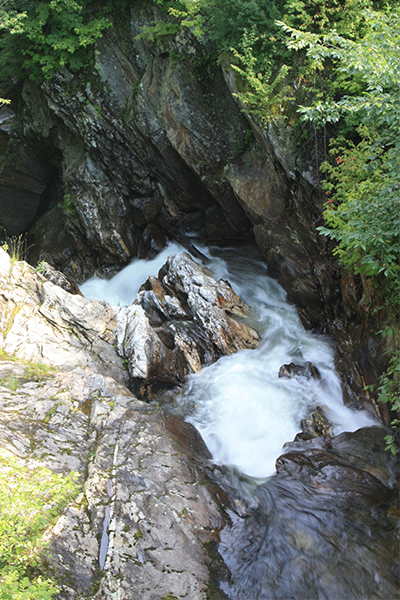 The first falls are upstream of the bridge. There is an 8-foot drop here, lacking in character and obstructed by a large boulder. The pool is full of small rocks and only inches deep. The falls that are downstream are also surrounded by private property. Access to the base of the falls is thereby impossible at this point in time. These falls are perhaps 15-feet tall, and then drop through an impressive curvaceous gorge. These falls are currently off-limits, although you can see a portion of them from the road. From the junction of VT 118, VT 58, and VT 242 in Montgomery Center, take VT 118 south for 1.6 miles and take a right onto Gibou Rd. Follow Gibou Rd. for 0.1 mile and park on a dirt pull-off on the left just before a bridge.